Fenerbahce's match-fixing scandal is not a conspiracy. It is far from being a political issue. Fenerbahce is, by far, the richest club in Turkey and takes refuge to patriotism just like any pathetic scoundrel. Before 2011, there was no particular law for match-fixing in Turkey. In some cases it was classified as a type of qualified fraud in football. However, there was no actual procedure or investigation as conducted under Turkish law against match-fixing, which entered into force in 2011. At the beginning, the underground propaganda was saying Aziz Yıldırım, the president of FSK, participated in a Northern Iraqi helicopter tender in spite of the will of Tayyip Erdogan, the prime minister of Turkey by then. However this 'pulp fiction' propaganda was soon, in a few weeks, replaced by a more improved one: a religious community, with antisecular agenda, was trying to take control of Fenerbahce club, supposedly the last surviving front of secularism in Turkey. There are much more tales that can be quoted. 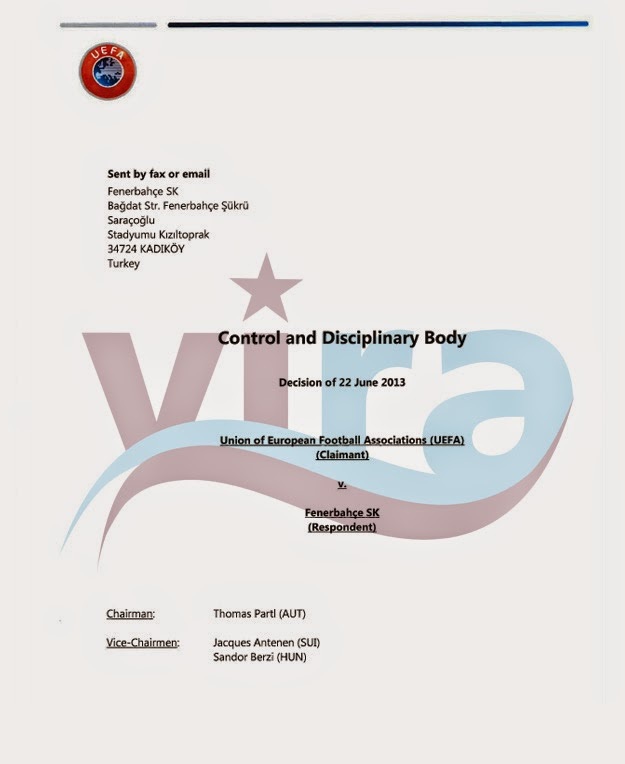 For example pro-Fenerbahce media even alleged that Miguel Lietard Fernandez-Palacios, the Spanish discipline inspector of UEFA was trained in schools of this antisecular Islamic community (http://haber.sol.org.tr/spor/uefa-sorusturmasinin-altindan-da-gulen-cikti-haberi-75076). Let's leave aside the numerous conspiracy theories and come to facts. As the most powerful club in Turkey, FSK had a strong say in drafting of the law. FSK lawyer and director Şekip Mosturoğlu, in a TV news show, said "We demand heacy penalties for football officials in the coming match-fixing law". Under that law, he was convicted guilty of match fixing, but his sanction was decreased by 75% thanks to a subsequent parliementary action that lightened the penalties to save FSK officials. In those days, no other club's official had such a strong say or influence in drafting of the law. There is no such media or parliementary record. FSK president Aziz Yıldırım alone, is detected to have used 13 different phone lines during the investigation. 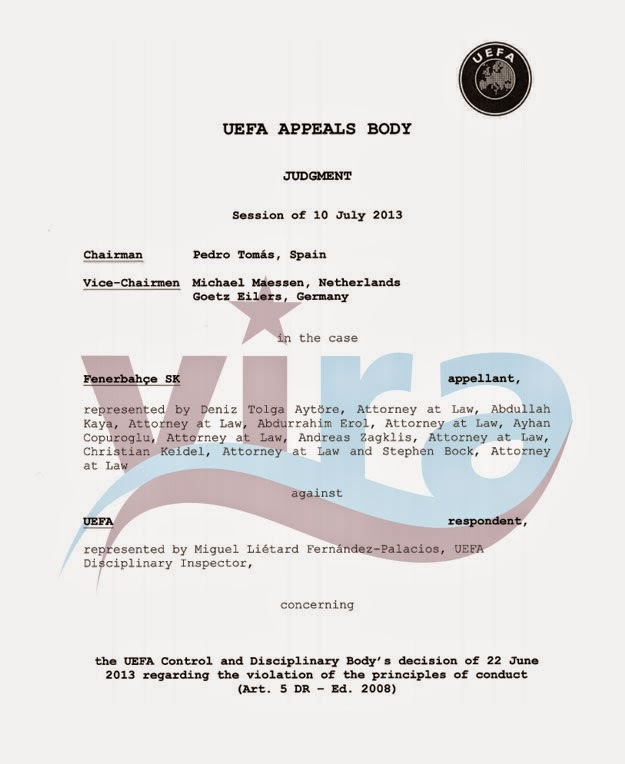 Why would a club lobby for heavy sanctions against match-fixing (and assure its competitors comply fully with the rules) and then use, for its own communication, 400 different telephone lines, which include the conversations that prove the match-fixing according to Turkish heavy penal court, Turkish appelate court, UEFA disciplinary committee, UEFA appeals committee and CAS tribunal. 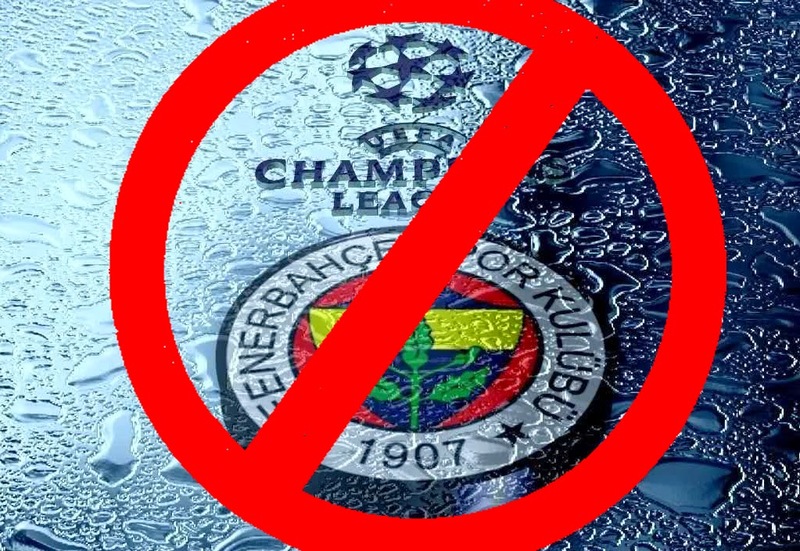 Fenerbahçe SK was banned from European matches for 2 years from 2013 to 2015 by UEFA out of its match-fixing crimes committed in Turkish Super League of 2010-2011. This message contains 13 pages Jjnduding cover page) Dear Sirs. We would appreciate your taking due note o( this decision and ensuring its implementation. The Appeals Body is satisfied that the Executive Committee member of Fenerbahçe SK Mr Eksiogiu had played a direct role in fixing the match Gençlerbirligi vs. Fenerbahçe played on 7 March 2011 of the 2010/2011 Turkish Super Lig. Numerous evidentiary elements support this conclusion, notably those contained in the Police Digest, the Ethics committee report, the decision of the TFF disciplinary bodies and the decision of the 16lh High criminal court. 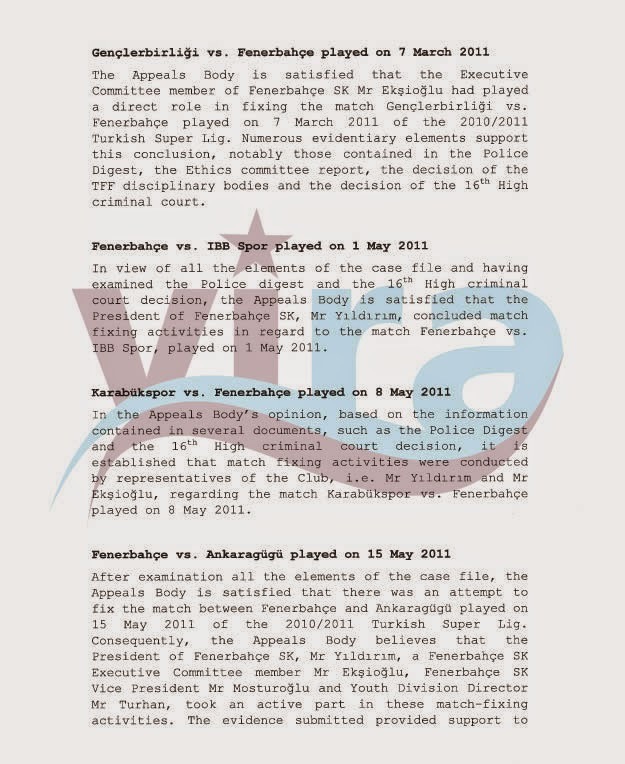 In view of all the elements of the case file and having examined the Police digest and the 16*n High criminal court decision, '.he Appeals Body is satisfied that the President of Fenerbahçe SK, Mr Yıldırım, concluded match fixing activities in regard to the match Fenerbahçe vs. IBB Spor, played on 1 May 2011. In the Appeals Body's opinion, based on the information contained in several documents, such as the Police Digest and the 16,h High criminal court decision, it is established that match fixing activities were conducted b.y representatives of the Club, i.e. 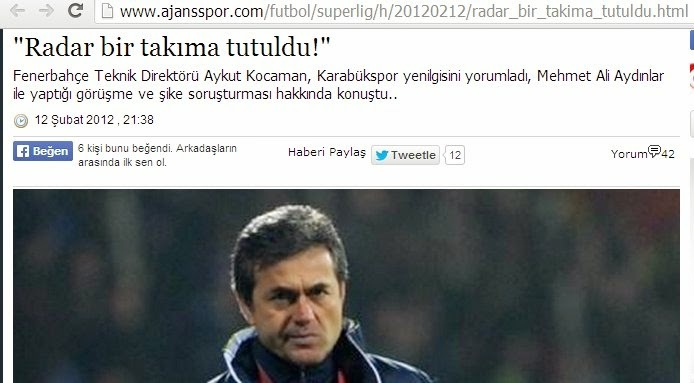 Mr Yıldırım and Mr ^kşioglu, regarding the match Karabükspor v*. Fenerbahçe played on 8 May 2011. Fenerbahçe referred the decision to CAS. 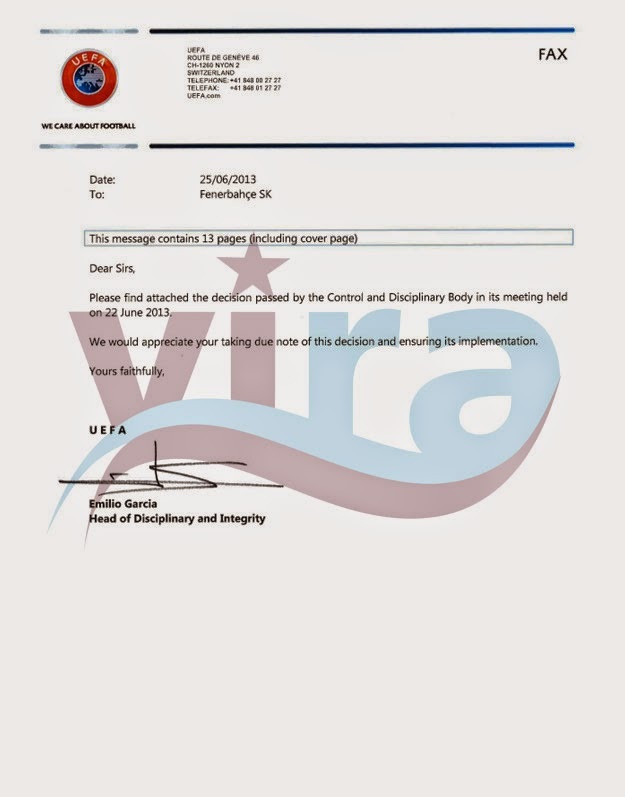 However, CAS also approved UEFA's decision. Click here for full decision of CAS on Fenerbahce's Ban.